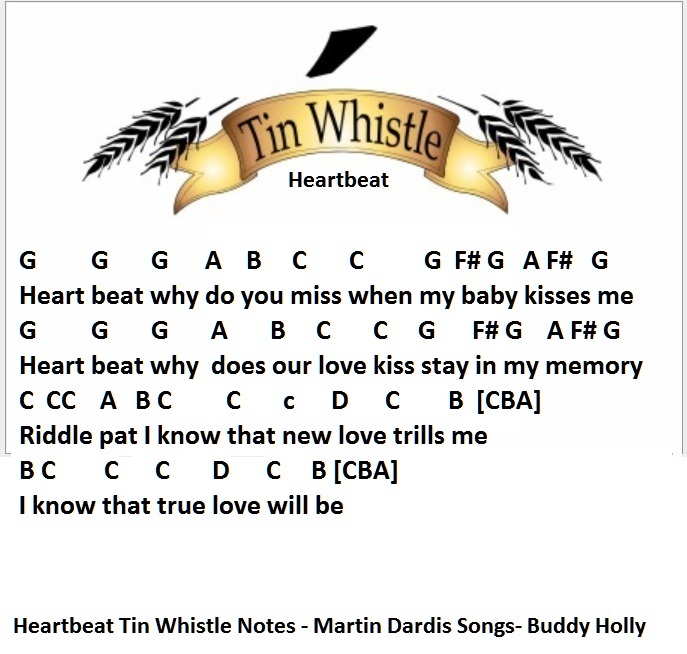 Heartbeat Tin Whistle And Piano Keyboard Notes. Words and music by Bob Montgomery and Norman Petty. A massive hit for Buddy Holly and the crickets way back in 1958. It has a lovely little melody that only uses 6 notes in total, but it's the way the tune is constructed that makes it so enjoyable to play. There are very few songs that only use 6 notes that I have come across.There's a little ''riff'' that goes before the start of the song and is also used in between the verses that I forgot to put in but it's basically just, BBBCB AAABA and if played makes the tune that bit more intresting to the ear. I have included a video lesson on how to play the song.